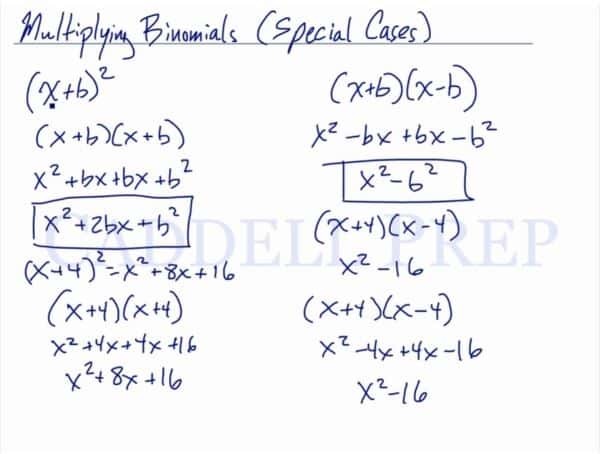 In this video, we are going to look at how to multiply binomials with special cases. By following this form, we can use this to solve any squared binomial. By following this form, we can use this to solve other binomials written this way. Let’s go over how to multiply binomials with special cases. This is multiplying a binomial by itself. This means that you can immediately get the product of these two binomials if you follow this format. I’ll do the math and check if that’s true. So, it’s supposed to come out like this. Let’s have another special case. Just like what we got earlier. So in these special cases, just follow the format that we have above.